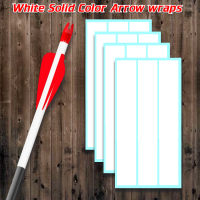 One color Arrow wraps are the most popular choice among archers for wrapping arrows. One color (Solid color). Our one color wrrow wraps are made from Oracal 651 vinyl material 2.5 mil. Adding a touch of expression with being practical as making your arrows more visible when in grass and weeds. Create contrast with wrap color mixing vanes and knock color. Note: All solid color Arrwo wraps have the option to be printed on. Print colors and design may be limited by type and color of Arrow wraps being printed on. Contact us with questions.